The breakthrough documentary, The Corporation, reveals that corporations are psychopathic with a single value: Increase profits no matter the cost to cultures, ecosystems or the planet as a whole. In tandem, Andrzej Łobaczewski’s Political Ponerology shows how hierarchies like corporations and governments draw psychopaths, so that today they dominate positions of power throughout the world. Yet, social justice advocates maintain with near parallel psychopathy that those who lack a conscience can be shamed into good behavior by waving protest signs or signing petitions. DGR elaborates on overall strategy and specific tactics. It shows conclusively how past strategies and tactics “ranging from ineffectual to ridiculous” have failed. Lighting candles, waving protest signs, or lobbying power as if it has a conscience has not stopped the ongoing destruction of Earth. At best, arrested protesters get publicity. But the business of destroying our planet proceeds unabated. No one with integrity would deny that the chemical, pharmaceutical, nuclear, and resource extraction industries, along with industrial agriculture and wars, are squarely to blame for the mass die offs over the past year. Even the USDA admits to killing a million birds a year, deliberately. The situation has become serious. Nearly three-fourths of scientists today acknowledge the Holocene Extinction (our time period), during which 150-200 species a day are going extinct. Citing Harvard entomologist Edward O. Wilson, the 200-a-day figure is hammered throughout the text. In addition to global and local economies, the ecological catastrophe of this ongoing mass extinction threatens every kingdom of life. Yet, having a thousand or 10,000 protesters arrested in front of the White House will not stop drilling for oil in the tar sands. Big Oil is going full steam ahead. DGR condemns such futile tactics. Instead, direct action is needed. The oil infrastructure is vulnerable, the authors assert. Any number of well conceived tactics can halt production, if that’s what you sincerely want to do. Similar tactics could be applied in the Gulf of Mexico, where 1,500 oil rigs are destroying an entire sea, directly affecting three nations. The Macondo blowout still spews oil today (see here and here). The ongoing health effects still make the news, as Florida Oil Spill Law continues to publicize. Gulf Coast residents would gain by following the rules of guerrilla warfare in defense of their health and livelihoods, as well as their environment. No matter how much (or how little) monetary compensation is given, the problem won’t go away until the rigs are shut down. The growing Dead Zone in the Gulf has long been blamed on agrochemicals. How hard is it to prevent those chemicals from reaching crop dusters? Going to the source, sabotage of genetically modified crops is a common tactic of militants protecting the biosphere. Hell, I’d be happy if militants blocked the delivery of fluoride to my city’s water plant. Even better, a group of conscious insiders could simply not add the agro-industrial waste. Probably more important, a halt to fracking would certainly help the biosphere, including us humans. And I can’t tell you how many times I’ve fantasized about firing a missile at the jets laying chemtrails over our skies. Nature helped recently. No chemtrails were laid during Hurricane Irene. For the first time in rural Florida, I saw thousands of stars and an arm of the Milky Way. A friend in New Jersey noticed the same thing. She cried. DGR recognizes that tactics must be weighed morally and for their strategic effect. Not all effective actions require defensive violence. DGR also recognizes that most people will not commend such actions, and warns potential underground resistance fighters to expect broad condemnation for any violence done in defense of the planet. But DGR has little patience for such collaborators – the first half of the book is a harsh criticism of the Left, coupled with a dismissive posture toward the Right. This is the book’s only weakness. The writers are caught in the false Left-Right paradigm that keeps the masses divided along an archaic French dichotomy that has little to do with today’s political realities. DGR cannot recognize that anyone on the “right” cares about a healthy environment. Yet, it applauds the Vermont secession movement and the local food sovereignty movement, both of which are substantially peopled by conservatives and libertarians who believe in smaller government and who recognize that only a healthy environment will provide healthy food. Forgiving that over-simplification, readers will gain much from the historical review of cultural resistance, and from the extended discussion of guerrilla strategy which comprises more than half the book. DGR analyzes past resistance movements, pointing out their strengths and shortcomings. Several charts emphasize their points. “The task of the activist is not to navigate systems of oppressive power with as much personal integrity as possible; it is to dismantle those systems,” writes Keith. We’re not going to vote, chant, protest, lobby or pray our way out of global catastrophe from eco-collapse. The global industrial system must collapse, instead. DGR admits that most environmentalists lack even a rudimentary understanding of arms and military tactics. Training will be required. As part of their grand strategy, DGR recognizes the need for aboveground parallel institutions to support the work of frontline militants and to provide for communities as civilization collapses. This work is already ongoing. Transition towns, local money, sustainable localized foodsheds, parallel voting systems and much more have already begun. Alliances will need to be forged between militants and aboveground activists, but given today’s panoptic police state, a strict security culture must be in place, they caution. Again, training will be required. There is so much more to this book – and all of it important, including the discussion of white privilege and patriarchy. Both are part and parcel of industrial civilization. Even if you’re not about to don the robe of anarchy, the book should at least convince you to support the work of those who do. Meanwhile, several dozen species went extinct today. In a world ruled by psychopaths who are systematically destroying the planet and who use violence to suppress resistance, the futility of nonviolence becomes apparent. Power does not relinquish anything without a fight. It is up to us to effectively stop them. 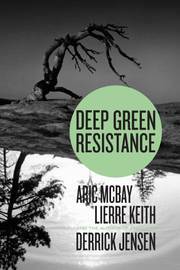 Deep Green Resistance shows how.